I could have never foreseen what I am doing right now at the end of 2015 when I announced to my colleagues at the department in sociology at DePaul University that I would be resigning from my position as a tenured professor to pursue theater and performance, or more specifically, to become a storyteller and a performing artist full-time. I couldn’t have predicted that I would be touring my own solo show at different fringe festivals in summer and fall, including Capital Fringe Festival in July, Minnesota Fringe Festival during the first half of August, Boulder International Fringe Festival during the second half of August, and Houston Fringe Festival in September. It has been an incredible journey, but I don’t believe I am doing anything different from what I used to do for 15 years. I am still teaching and educating, except I am using a very different yet far more powerful creative medium, storytelling. Why is the art of storytelling particularly significant at this historical and political juncture? The truth is: Facts are no longer sufficient to convince, persuade, or to change minds, not to mention to change hearts. What I would like to do fundamentally is not only to change people’s thinking but also to change their heart because changing mind is just not enough anymore for social changes. I was trained as a social scientist and a qualitative researcher. I received my Ph.D. in the discipline of sociology. While my discipline values the cult of objectivity and detachment and trains its members to present impassioned arguments with data, I have always known that it is the stories, the complex and conflicted ways people make meanings out of their experiences and make sense of their world, that have far reaching power to connect with people both cognitively and emotionally. During my duration as a professor, I used storytelling as part of my pedagogical tools in the classroom. I juxtaposed my own personal stories along with research data and presented them both in my lectures. If research results are the so-called cold hard facts, then stories put a human face to them. Stories help demonstrate how facts manifest themselves in people’s real lives. Constructs and theories are abstract; stories show how they work in reality and in concrete. Abstract ideas are the skeletons; human experiences, the stories people tell, and the meanings and emotions accompanying them, are the meat that fills up the skeletons and make them full and round. My solo show, Not Quite, is comprised of stories about my experiences as a queer immigrant woman of color. I tell stories about the citizenship process, how the alien status continues to be institutionalized through administrative instruments, how power functions both structurally and interpersonally, and how our identities are so interconnected that you can’t really talk about them separately. In the first segment of my solo, I talk about my own experience of participating in the citizenship ceremony. It is indeed true that the immigration process is difficult for people to understand. I don’t fault people for not understanding it. Immigration regulations and laws, as they are, may appear objective and detached, yet they can often be implemented differently depending on who you are and take on subjective meanings and significance for individuals depending on their group membership. Getting legalized and becoming a citizen is one thing; creating a home, feeling at home, and being home in a foreign land is another. Uttering the above abstract sentences will not connect with people emotionally, not to mention for people to get them if they have never gone through the process. When I tell the story about going through the citizenship process, what I want to illuminate is the vulnerability I experience (even as a very privileged immigrant) and capricious nature of the immigrant status under the nation-state. I want to show how the state can determine whether you have the right to stand on a piece of land and how its power can strip away whatever you have built in an instant. What better way to show this than by describing the application process and the swearingin process, through which I recount my thoughts, feelings, and paranoia minute by minute, through which the hypocrisy of the rhetoric about American exceptionalism can be exposed, and through which the state’s control over the population through administrative instruments, such as numbers, can be illuminated? What better way to show by taking people on that journey with you step by step? My stories are never just my stories. My stories are also about the larger social forces at work. Through stories, I tell and show my personal experiences as I participate in the larger structural processes as an individual as well as a member of different groups. I want to show how the larger structures operate from my particular position and how they might shape our shared and different experiences. My experiences might be personal, but the structures and forces that shape us are shared and they render our experiences similarly and differently. Stories help shed light on both the personal and the universal. They enable us to tell our own experiences without erasing others. Through stories, I ask: Do you see me as human? Or do you still see yourself as human? If yes, do you see our shared humanity? If yes, how do we make the world a better place for everyone? I mean, EVERYONE! Not Quite is lived, written, and performed by Ada Cheng. Tickets are available here. Ada Cheng is a professor-turned storyteller and performing artist. She was a tenured professor in sociology at DePaul University in Chicago for 15 years. She resigned from her tenured position in 2016 to pursue theater and performance full time. She has been featured at storytelling shows in Chicago, Atlanta, Cedar Rapids, New York, Asheville, and Kansas City. 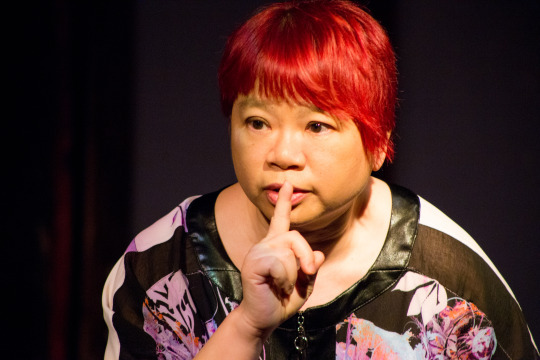 She has performed her solo show, Not Quite: Asian American by Law, Asian Woman by Desire, at National Storytelling Conference fringe and Capital Fringe Festival. She is currently touring her solo show at Minnesota Fringe Festival, Boulder International Fringe Festival, and Houston Fringe Festival. Her book, Standing Up: From Renegade Professor to Middle-Aged Comic, published in 2016 by Difference Press, encourages mid-lifers to pursue their dream amidst chaos and uncertainty. Her motto: Make your life the best story you tell.